Summer is upon us, and for any pre-organic or current organic chemistry student, with this time of supposed rest and relaxation also comes a bit of anxiety and worry. But there’s no need to stress! Here are five tips to help anyone feel confident and be prepared for one of the most rewarding courses in all science curricula. Click here to take the “Are you prepared for organic chemistry?” quiz! Just stick to the basics! No one is going to be an organic chemistry savant right off the bat. There may be a bit of complexity and head-scratching at most, if not all, organic chemistry problems and questions. But at the heart of all those questions and problems lie a bunch of universal, fundamental concepts that are the building blocks of organic chemistry that anyone can call upon. These basics, which we will touch on a few of below, include some simple concepts that will go a long way towards really building a mastery of the subject. One of the basics that you should definitely spend some time on is being familiar with Lewis Dot structures, which are essentially a convention that allows one to “see” the available electrons surrounding a given atom. Spend some time knowing how to determine how many electrons belong to a given atom and how to draw its Lewis Dot structure, and before you know it you’ll really understand how an atom reacts (or won’t react) with others to form more and more complex molecules. Everyone has the natural aptitude to succeed in organic chemistry. Though the material can get quite complex and dense, at its core are concepts that are all accessible and relatively easy, things that everyone can master. 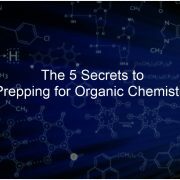 The amount of preparation to truly get a grasp of organic chemistry can certainly be intimidating to some, and for admittedly good reason. However, with a bit of practice and exposure, one can begin to develop what my old orgo professor used to describe as an “Orgo Sixth Sense.” And no, that isn’t your favorite science spin-off of a 1999 horror film; it’s supposed to be this mindset you develop to instinctually know how a certain atom or molecule behaves, or why you would use a certain set of chemicals in an experiment to get a desired product. That Orgo Sixth Sense will come with practice, but — once again — it’ll just develop by sticking to and mastering the basics! Riding the coattails of number one above, another one of the organic chemistry commandments, if you will, is to truly learn the IUPAC (International Union of Pure and Applied Chemistry) method of naming organic molecules. It can be quite overwhelming trying to go back and forth between the name of a given molecule and its corresponding structure; if you’re planning on looking names up on-the-go, then I’m sorry to say it, but you’re doomed. This is unfortunately something that there really is no getting around: you just need to trust me on this one, and put in the time and effort to memorize the names. Think of the time when you memorized your multiplication tables — you just need to memorize it, but after you know it, you’ll find it easier to understand all the other, more complex concepts that build upon that very foundation. Lastly, more often than not your very first exam will have a decent portion of questions dedicated solely to naming a structure, or even providing the structure from a name. You should be able to work with this naming system inside and out — put in the time and get to know it. A good way to really ace the naming convention is through the use of Orgo Made Simple’s full year naming guide! We offer a thorough guide as to how to name molecules and how to match any molecule’s name with its appropriate structure. Naming questions will surely be on your first exam in the class,so it is absolutely vital to take advantage of resources such as this one to maximize your points on that exam. At times, it will be difficult to get through some material, especially when it seems to present information particularly abstract — something that organic chemistry can be exceptionally good at doing. So what might possibly help is relating this organic chemistry information back to you! How might you see some of these reactions in your everyday life? What do these reaction schemes remind you of? For example, the general combustion reaction is one that is fairly easy to remember when applied to personal experience. Organic material combined with O2 yields CO2, H2O and energy. Since all reactions are technically in equilibrium, the more O2 (or organic material) you add, the more energy you get out. This kind of knowledge proved really useful to me at our last family barbecue: the fire was growing weaker, but I needed more energy to properly cook our food — and in came some organic chemistry knowledge. I opened the hood of the grill and fanned the flames a bit so that my fire could “breathe.” I also gathered up some dry leaves and twigs to get a quick burn. In other words, I added more organic material and O2 to the reaction, thus “pushing” the reaction to the right and getting more energy and, most importantly, well-cooked barbecue! Just a good general study tip: always preview and review your notes and study materials! Going into any lecture, it’s difficult to really wrap your mind around the material (that you will surely see on your upcoming exams), without any kind of frame of reference as to where your professor/instructor is going with their lecture. You should always also be up-to-date as far as keeping up with the lecture material. At the pace of any class — especially one as intricate and dense with material as organic chemistry — in higher education, it can unfortunately be quite easy to fall behind. Thus, it is imperative to always be on top of the material. Even more important than knowing the material in your notes? Knowing what you don’t know in your notes! It’s difficult to clarify the finer points in your study materials when you don’t know what’s in them. Once again, riding on the coattails of an above tip, it is sometimes more important to spot what you don’t know rather than what you do know. But even if you pore over your notes countless times, you still might not see what you don’t know. Therefore, you need some alternate viewpoints into the lecture material. You would benefit from having peers challenge you — and, conversely, you them — on different topics, to gain a different perspective and really understand organic chemistry material inside and out. 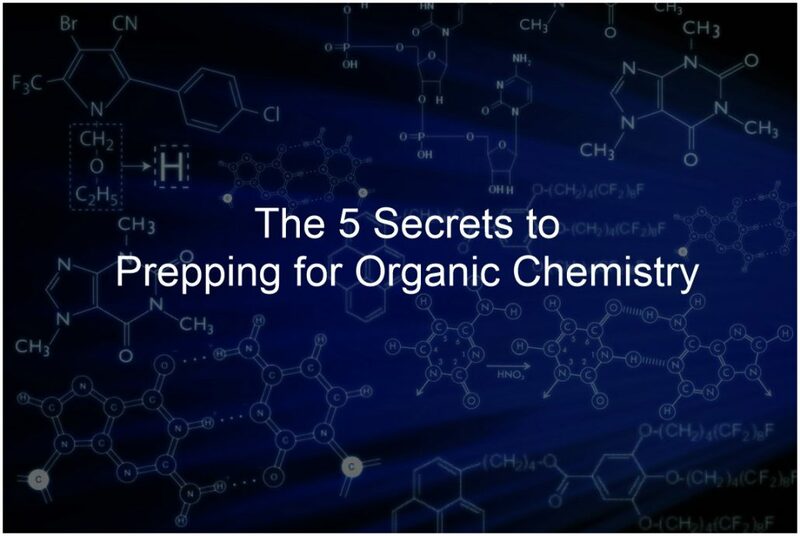 At the end of the day, you will truly want all the practice and preparation you can get your hands on if you really want to succeed in a course as demanding and rigorous as organic chemistry. Though it is difficult and can get a bit intimidating from time to time, remember: you can do it. You have the mental capacity to succeed; you just need to apply yourself to working for that deserved good grade. Here at Orgo Made Simple, our Prep Course will prepare you for the material that you will see in your lecture and on your exams, and that extra preparation might be the difference between full letter grades. Once you get into the truly challenging, intricate material, it gets harder to understand some of those concepts unless you practice. The Orgo Made Simple Prep Course can help offer you that additional practice you need all in one convenient space, and we will work with you to get through those problems and eventually develop that mastery over organic chemistry to truly succeed in your course. Click Here to Learn More About the Prep Course! These are just a few tips that I can offer you as you prepare for one of the most rewarding and engaging courses you will ever take! Find what works for you, be confident in your abilities and keep in mind the bigger picture and how organic chemistry fits into the scheme of things. I will be back with more help and blogs to work with you all through organic chemistry.